Michal Kwiatkowski says his Etixx – Quick-Step team were unlucky with how things panned out for them at Milan-San Remo, and took to Twitter after the race to show-off his damaged helmet from a crash on the descent of the Poggio. The world champion hit the ground along with his teammate Zdenek Stybar, while other contenders for the race Philippe Gilbert (BMC) and Gerald Ciolek (MTN-Qhubeka) were also caught-up. Having lost Mark Cavendish to a mechanical earlier in the race, Kwiatkowski and Stybar were set to try their hand in the finale, which was eventually won by John Degenkolb (Giant-Alpecin), but were left rueing what might have been after their fall on the technical Poggio descent. Bad luck today, especially that both of us were on the ground,” Kwiatkowski said after the race. “The race looks different than what it could have been if that didn’t happen. We did it perfectly today, my teammates did a great job putting us into good position. 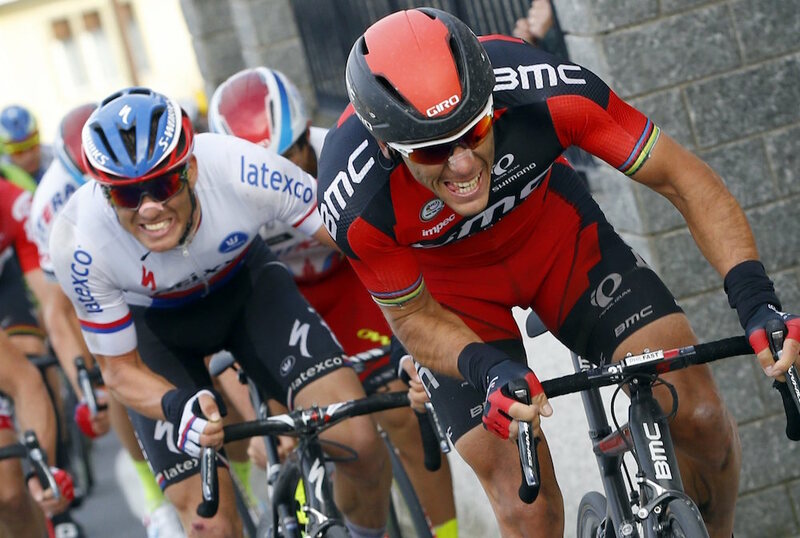 For the first time at Milan-San Remo I was there on the Poggio. We felt really comfortable. It was still a big group. The Pole posted a picture later on Twitter with his damaged Specialized Evade helmet, which he says saved his life, and said that he didn’t suffer any injuries from the crash that could jeopardise an upcoming Classics campaign. Czech national champion Stybar also came away unscathed despite crashing earlier on in the race on the descent of the Capo Berta, which also saw the likes of Alex Dowsett (Movistar), Chris Juul-Jensen (Tinkoff-Saxo) and Salvatore Puccio (Team Sky) hit the deck. Stybar was also left with regrets from the race after showing strong form coming into La Primavera, with a impressive win at Strade Bianche earlier in March. “Today I was really unlucky, I crashed twice,” Stybar said. “The first time I crashed on the downhill of the Capo Berta when other riders went down in front of me and I couldn’t avoid them. But I was fortunately able to get up and ride immediately. Then I crashed for the second time on the descent of the Poggio when someone crashed in front of Kwiato and I. At that point my race was over. “I had good legs today and it’s a shame I couldn’t get to the finish and we couldn’t play all our cards,” he added, “even if because arriving in Via Roma after 300 kilometers of riding the sprint is always strange and anything can happen.